The Colombo High Court today remanded former General Secretary of the United National Party (UNP) Tissa Attanayake in case against him for allegedly preparing fraudulent documents. The former Minister has been ordered to be remanded until 5 December. Earlier, the Colombo High Court had issued a notice on Attanayake to appear before the Court today. 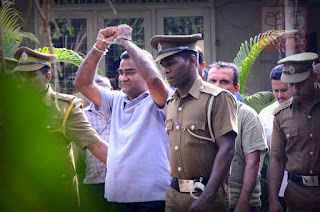 The Attorney General indicted Tissa Attanayake over the case on September 09. The former UNP General Secretary had been accused of forging the signatures of Prime Minister Ranil Wickremesinghe and President Maithripala Sirisena in a letter. Attanayake, who defected from the then opposition and was made Health minister for less than three weeks, is accused of fabricating the document to discredit the President and the PM. Attanayake has said that the purported document was received by him the day he assumed duties as health minister.